GO KARTING: GRAND PRIX – Considered the ultimate karting experience for groups. Enjoy the thrill of a grand prix with your friends. Do you have the skills to get out of qualifying and race in the final? A grand prix consists of two qualifying sessions with the top drivers taking part in the final to be crowned champion. 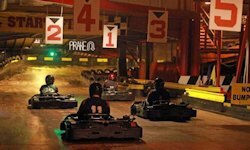 The venue is home to the world’s largest indoor karting arena, consisting of tunnels, bridges and underpasses, making it one of the most exciting karting tracks in the world. This activity lasts for usually a 2 hour period and all participants are kept busy driving or cheering. Great Fun Photos – for Facebook – get to know new friends in the party before the big night ahead.